This guide is the first of a series in which I give you detailed step-by-step instructions on how to build a virtual cluster with Xen. The cluster thus built might not be appropriate for your case, and does reflect the author's preferences and/or needs, but if you are new to clusters or Xen, it will hopefully help you get started with both. The network configuration on which to build the virtual cluster. 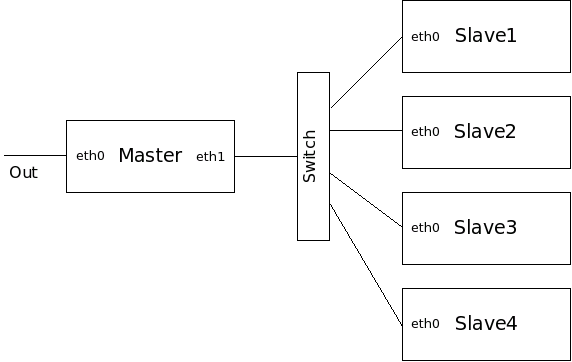 The network structure of this first attempt will be very simple, the master having two network cards, one to the outside world and the other one connected through a switch to the slaves. The virtual cluster is shown below in Figure One. In this section, we will do the basic work to get our virtual cluster ready, by installing Xen. As per the remainder of the guide, if you are an experienced user, you might want to deviate from the steps provided here, although then you may have to solve a number of problems if they arise. If you have no such experience, I would suggest you to follow this guide as close as possible the first time, and later redo your cluster if you wish. Furthermore, to make sure that you can follow the steps precisely, you would need a computer ready to be wiped clean (i.e. a sandbox system). In addition, it is assumed that you will be able to get appropriate necessary IP addresses and names for you system. (one for the host computer and another one for the master node of the cluster). Let's start with a fresh install of the operating system in a moderately powerful computer (in my case a Dell Optiplex GX 280 with 1GB of RAM and a 150GB disk). As configured here, the master needs 128MB of RAM and each slave 64MB, so if you wanted to configure many more slaves, you should probably get more RAM. Disk space is not an issue, as the master requires roughly 2GB and each slave 1GB (to a grand total of 6GB). In this guide we assume a Ubuntu version 5.10 system. In principle Xen would work with any other distribution, but Ubuntu has become really popular lately, and it provides a very simple install, requiring only one CD, which you can download from one of the Ubuntu mirros (5.10 is not the most current version, however). For my Dell Optiplex GX 280, I downloaded one ISO file, burned it and installed Ubuntu from it. The installation of Ubuntu is truly simple and the only relevant things to mention are: We don't want bells and whistles for our host machine, so when asked, type "server" to perform a server installation. In our case the host machine is called "yepes" and the user account "angelv" When asked about partitions we selected to ERASE THE ENTIRE DISK Assuming you have a DHCP server at your place, the network will be automatically configured to use it. Shortly you should have Ubuntu installed in your machine. Bear in mind that in Ubuntu there is no root account as default, so all the privileged commands are executed with the "sudo" command with the user account just created ("angelv" in my case). As shown below, we will need to install some extra packages which are needed for Xen (see the Xen manual), and for convenience, we will change the network configuration to use a static IP address. DNS configuration is probably properly configured already, but check the file /etc/resolv.conf. Restart the network (with commands: sudo ifdown eth0 and sudo ifup eth0), and verify that everything is correct (you can use the command ifconfig and use the text-based web browser lynx to verify that you can access the Internet). You can now reboot the machine, and verify that it boots into the Xen kernel, and check that Xen is running correctly by running the command sudo xm list, which should show that Domain-0 is the only machine at the moment. angelv@yepes:~$ dd if=/dev/zero of=/tmp/zero.xen bs=1M count="1024"
Note that the entry vif for the master has two values, which will configure it as a machine with two network cards, and the entry vcpus for the slaves has the value 4, which will configure them as SMP nodes with four processors each. With the steps performed until now, we would be ready to start all the five machines, but we will need to modify the default network settings. We could either do this by booting the machines and performing the changes on a live system, or better by modifying the images before booting it. Let's first configure the master node. As stated at Jailtime.org the root password is password. Obviously you should change it right now. Check that the values for the network cards are correct with the command ifconfig Verify that you have network connectivity (for example by doing wget -nd http://www.google.com) Once inside a virtual machine, we can disconnect by typing Ctrl-] To reconnect to the virtual machine from the host machine, we can use the command sudo xm console master (the name provided in the configuration file). You will have to press the return key to obtain the prompt. And now we can reboot the machine to test it. (To reboot it cleanly, issue the command halt from inside the master node (boldo) and then issue the command sudo xm create -c /etc/xen/cray/master.cfg from the host node (yepes). After this, we will repeat the following three steps for the four slaves (change slave1 for the corresponding slave node): We mount the OS image and modify the files ifcfg-eth0, fstab, network, and hosts so that the contents are similar to what is shown below. The contents of these files should be the same for the four slaves, except the IPADDR field in the file ifcfg-eth0 (x.x.x.11 for slave1, x.x.x.12 for slave2, etc.) and the HOSTNAME field in the file network. To finalize the configuration in the slaves, we need to install portmap, create the cshare directory and a user account. We do it by chrooting to the directory where we mounted the OS image. We start slave1 and verify that the directories are actually mounted with NFS, and that as user angelv I can write in my home directory and that I can ping the master node. PING boldo (192.168.1.10) 56(84) bytes of data. After doing the previous steps for the four slaves, we now have the basic settings for our virtual cluster. In the host machine, we can see that there are (besides Domain-0) five machines running, the master and the four slaves, by issuing the commando sudo xm list. This configuration is the basis for our next installment which will show how to install the Modules package for easily switching environments, the C3 command suite, a version of MPICH for running parallel programs, and the Torque/Maui for job queue management. Angel de Vicente, Ph.D, has been working during the last three years at the Instituto de Astrofisica de Canarias, giving support to the astrophysicists about scientific software and being in charge of supercomputing at the institute. Being in the process of upgrading their Beowulf cluster, he lives of late in a world of virtual machines and networks, where he feels free to experiment.